It's a cranberry and orange week... if you missed it, here's the Cranberry Orange Bread post from earlier. In a large bowl, combine the egg, maple syrup and vanilla. In a smaller bowl sift together the almond meal, brown rice flour and baking powder. Add the dry ingredients to the wet and combine. It will be a bit crumbly. Next, add in the orange juice/pulp and zest along with the cranberries and grapeseed oil. Mix well and a dough will begin to form. Wait to pull apart until after they have baked and cooled. Bake on the parchment at 350° for about 10 minutes. I have really missed scones so these were a special treat. If you are looking for grain-free version, I have a blueberry one here. I pretty much just love bread. And I love my baked bread. I know, vain. But it's true. I may not always have a stellar turn out...but lately they have been pretty dang awesome. It seems that cranberries and oranges are in the front of every grocery store these days. In season, fresh and calling my name, I grabbed a bag of fresh cranberries and some Satsuma's and pondered a recipe. In a small mixing bowl, whip the egg whites so that they begin to turn white but not frothy. Set aside. In a large mixing bowl, thoroughly combine the banana, egg yolk and vanilla. In another bowl sift together the almond meal, brown rice flour and sea salt. Add the dry ingredients in with the wet and mix well. Add in the oil, orange juice/pulp and zest along with the cranberries. Next, add in the apple cider vinegar and baking soda. Give it a good stir and then fold in the egg whites. Keep mixing until a nice dough forms and all ingredients are incorporated. Bake at 350° in a greased bread pan (I used grapeseed oil) for about 25 minutes uncovered and 10 minutes covered for a total of about 25 minutes. Staying true to Thanksgiving, I am so very thankful for my family and their willingness to try new things and not just help make dishes that we too could eat but also eat and enjoy them too. Days of planning, hours of preparation and hours to make, about 30 minutes to eat...so worth it. I cannot tell you how long it's been since I had pecan pie before this one. And it use to be my favorite kind of pie. Well, now I can have it again. And I am THANKFUL for that this Thanksgiving. This is another one of my sister's Sarah's recipes. It took a couple of test runs but this one was perfect. In large bowl, mix all ingredients together until a ball forms. Press the dough evenly into 9” glass pie pan. Form edges as desired. Chill crust for about 1 hour before adding the filling. Note: For recipes requiring baked crusts, bake at 350˚F for about 7-12 minutes until golden brown. If edges start to brown, carefully cover edge with aluminum foil or pie shield and allow the remainder of the crust to turn golden. This one will be baked with the filling so don't bake the crust just yet. Mix all ingredients, except pecans until well blended. Pour mix into unbaked pie crust. Arrange pecans on top. Cover entire pie loosely with aluminum foil and bake, covered, for 40 minutes. Uncover pie and cook for an additional 10-15 minutes or until center is set. Allow to cool for 2 hours and refrigerate until ready to serve. Oat made it's way into many of the Thanksgiving dishes this year. If you have severe gluten sensitivities, make sure you are buying certified gluten free oats. I use Bob's Red Mill Whole Grain Rolled Oats. Combine all the ingredients by whisking them until well incorporated. Add the filling to the unbaked pie crust. Bake for 45-55 minutes. Cover the crust with foil or a pie shield after about 30 minutes. We felt like we needed another green with our Thanksgiving Feast this year so my sister, Sarah, made one of her specialties, Brussels Sprouts & Onion Saute. Alas, I am missing photos of this one too ( I must have been getting hungry. Or lazy)...but I assure you, it was tasty. And added that extra 'green' we needed for our meal. In a large sauté pan, heat coconut oil over medium-high heat. Add diced onion to pan once heated. You should hear it sizzle. Slice Brussels sprouts and add to pan. Stir frequently as to not burn the sprouts. Cook about 10- 15 minutes or until the sprouts start to caramelize. Add salt, pepper, and garlic powder to taste. I think I'll be making this dish more or maybe even roasted. Brussels sprouts contain a ton of nutrients including several antioxidants and they contain just as much vitamin C as oranges in serving with fewer calories. I've been writing the recipe blogs for our Thanksgiving Feast and I'm a bit tired. And this one is really simple. Like silly simple. It's ham. An 8lb bone-in ham. Bake at 325° (high altitude, 350° otherwise) covered on the bottom rack for 2 hours (or 15 min for every pound). We had no shortage of pies for our gluten, dairy, yeast and soy free Thanksgiving Feast. Seriously, this may have been the best Thanksgiving meal I've ever had. Of course, my grandmother use to make up to 40 pies, yes 40, for our ever-growing family when I was kid...and at that time I was eating all things gluten and dairy, so, 'fully loaded' ...so... yeah. Mix all ingredients together until well combined, press into a pie dish and bake at 350° for 15 minutes. In a medium size mixing bowl, mix all ingredients together until well combined. Pour on top of the crust and bake at 350° for 50 minutes. What other time of the year than Thanksgiving do people bake a whole turkey? I'll get right on with this one. Preheat oven to 325˚(we were at high altitude, 350° otherwise). Place oven rack on lowest level in oven. Remove the giblets from the main cavity and neck cavity. Discard the liver (or save for feasting later if you so desire) and save the rest for gravy. Pat the turkey dry with paper towels, place in roasting pan with the rack let sit at room temperature for 2 hours. Discard any liquid at the bottom of the roasting pan. Wash and dry the roasting pan and rack. Place the turkey back in the rack, breast side up. Rub 1 tbls of the Compound 'Butter' in the main cavity. Then place the onion, apple and bay leaves in the main cavity. Rub the remaining 'butter' on the inside and outside of the turkey skin. Secure the legs under the flap of the tail skin or tie them together. Bend the wingtips back behind the turkey, securing any loose neck skin underneath the wingtips. Pour in the cider and cover with foil. Roast for 1 hour. Then remove the foil and roast another 2-3 hours. If the top is beginning to brown a bit then leave the foil on. Baste every 30 minutes and rotate the turkey 90° each time to ensure even cooking time. When the thickest part of the thigh reaches 165˚F, remove and drain the main cavity into the pan. Place on a cutting board and cover with foil for about 20 minutes (if it's going to be longer for the other food to be ready then cover with the foil and then a towel). Have I told you how much I love Thanksgiving? And stuffing? Preheat oven to 325˚F (this was for high altitude, 350° otherwise). 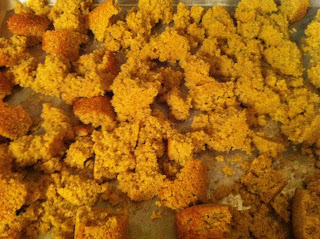 Crumble the cornbread into ¾ inch pieces and place in a deep casserole dish. Heat a large skillet on medium and then add the venison. Brown the venison so that it's still a bit pink on the inside and then add in the onion, apple, mushrooms, salt and pepper. Cook until onions and apple start to become soft about 7 minutes, stirring occasionally. Add in the garlic and raisins. Cook until they too become soft, another 7 minutes, stirring occasionally. Pour the broth over mixture and sprinkle in the sage, cook another 5 minutes, stirring frequently. Then place the stuffing mixture in the casserole dish and toss with the cornbread pieces pour the water over the mixture. Bake (above the turkey) covered for about 30 minutes and then uncovered for about 10 minutes to crisp. Yeah... I love stuffing. And elk breakfast sausage. A lot. Thanks brother Jon for providing the elk. This was used for the Elk Sausage Cornbread Stuffing we had for Thanksgiving this year. Preheat the oven to 375˚F (High Altitude, 400° otherwise). Coat a glass baking dish (6x6) with coconut oil (or another oil) and place on top of the oven (not inside) while it preheats. Combine the dry ingredients in a large mixing bowl. In a medium mixing bowl beat eggs well. Add in the sugar and rest of the wet ingredients. Slowly add wet ingredients to the dry ingredients. Mix well until it looks like a batter. Pour batter into the greased glass baking dish for about 20 minutes. Turn the oven off while leaving the bread in for about another 5 minutes. While I have been wanting to make some homemade chicken soup, this one was premeditated in preparation for recovering from surgery this week. Back in my gluten and dairy eating days, I made a fantastic homemade chicken dumpling soup (all from scratch). So, I climbed on my counter, dug through my cabinet for my old recipe book and found my chicken scratch (no pun intended) of a recipe. This was adapted from that. Despite the multiple steps, this soup really is quite easy to make, though expect it to take about an hour to prepare. Steam the potato and parsnip for about 12 minutes or until tender. Set aside. (You can use this time to chop all your veggies and the chicken). In a large pot, heat two tablespoons of olive oil on low-medium heat. Add in the onion and saute until they are just about translucent. Pour a couple more tablespoons of olive oil in and add in the chicken, cook partially (still a bit pink in the middle) then add in the celery and carrots. Saute for about 5 minutes. Mash the potato and parsnip together with 1/2 cup of water. Set aside. Add the broth and water to the saute with the salt, pepper and garlic and bring to boil. Cover and simmer for about 12 minutes (stir occasionally). Add in the zucchini and potato/parsnip mash. Give it a good stir and bring to a slow boil. Boil for about 5 more minutes. I will definitely be making this one again... Consider adding other spices such as sage, turmeric, cayenne pepper etc. Mmm... yum! This dish was dreamed up when I decided to cook my sister and her husband dinner on short notice. Hm... what to make that is relatively easy and relatively fast? And something that is staying true to 'fall' as it was Halloween night. These just so happened to both take the same amount of time in the oven, at the same temperature. Love it when that happens. Slather each chicken leg with some of the olive oil oil and rub in the seasoning. Bake at 400° covered for 35 minutes. At 35 minutes, uncover and bake for about another 18 minutes or until the chicken is done throughout. Toss all of the items with olive oil, add in the rosemary and salt and pour the Chardonnay over-top. Bake at 400° covered in a casserole dish for 35 minutes. At 35 minutes, uncover, drain about 3/4 of the liquid out and bake for about another 18 minutes (it will be done when the chicken is done). In a medium size pot, bowl the strips of zucchini for about 4 minutes, strain and set aside. Heat the coconut oil on low-medium in a large skillet. Add in the onions, mushrooms, carrots, seasonings and saute until the veggies are tender (onions should be nearly translucent). Add in the kale, chicken broth and arrowroot powder and saute until kale begins to soften. Bring to a slow simmer. Next, add the pumpkin and coconut milk. Continue to simmer with a cover on for about 5 minutes. Mix the cheese into the veggie concoction (alternatively, you can leave out and add in as layers in the pie dish). Place half of the zucchini noodles on the bottom of a pie dish. Top with half of the veggie concoction and top that with the rest of the zucchini noodles. Top off with the rest of the veggies and smooth out the mixture. Bake at 375° for about 10 minutes or until the top begins to harden. The pumpkin was extremely subtle and actually provided a 'creaminess' more than flavor; which went brilliantly with the macadamia nut. Ingredients will be on my next shopping list, definitely a make-again. This recipe was a direct result of buying entirely too many groceries for myself this past weekend. So, I am bound and determined to not let anything go to waste. But how am I going to use up and eat a massive amount of veggies? Hm... soup. Cut the acorn squash in half lengthwise, remove the seeds and bake face-down at 400° for 45-60 min depending on the size of the squash. Once the squash is done, allow to cool a bit while you prepare the rest of the ingredients. Steam the broccoli for about 12 minutes. Meanwhile, heat a pan on medium with the coconut oil and saute the leeks, onions and spinach with the spices. Remove the flesh of the acorn squash and add to large pot with the chicken stalk and coconut milk. Add in the saute and broccoli and bring to a boil. Cover, reduce the heat and simmer for about 10 minutes. Using a Kitchen Aid, blend the mixture together until it's your desired consistency (alternatively, you can use a food processor if you want it to be pureed). Ah... and there we have it, lovely Acorn Squash and Broccoli Soup.